Happy Peanut Butter and Jelly Day! Yes, today we are all excited that it’s National Peanut Butter and Jelly Day. I simply cannot think of such an enjoyable combo without being reminded of my childhood and of all the packed lunches that I enjoyed in the school cafeteria. Back then, I was able to filter out all the hyperactive chatter and loud crowd hum of the cafeteria and enjoy the first bite of my pb & j sandwich. Among all the chaos of my school day, peace and calamity had finally arrived in the shape of square…a tender and delicious square of happiness. We all know about peanut butter and jelly. It’s an American staple and one of those snacks that can take us back to the past and pull us right back into the present, because although nothing can beat the memory of your lunchtime peanut butter and jelly sandwich right before recess, such treat can still be enjoyed as an adult. And to celebrate this national holiday, you can indulge in this Peanut Butter and Jelly Ice Cream Sandwich, which is a very delicious and approachable recipe thanks to the KitchenAid® Ice Cream Maker Attachment and the 5-Speed Ultra Power™ Hand Mixer. I think the more efficient way of doing this recipe or any recipe that involves homemade ice cream is by dividing the steps among two days. On day one we will focus on preparing the ice cream base and the peanut butter shortbread. On day two we will focus on spinning the ice cream base and on assembling the ice cream sandwiches. First, you can make your ice cream base. This ice cream base is a neutral ice cream base with a little bit of vanilla flavor and grape jelly folded into the spun base. To prepare the ice cream, prepare an ice water bath by filling a large bowl halfway with ice and water. Set it aside for later use. Combine heavy cream and milk in a saucepan and bring to a simmer. Meanwhile, combine yolks, sugar, and salt in KitchenAid® Stand Mixer bowl. Attach bowl and wire whip to Stand Mixer. Turn mixer to speed 2 and mix for about 45 seconds until mixture thickens and becomes pale yellow in color. Continuing on speed 2, very gradually pour simmered heavy cream-milk mixture into Stand Mixer bowl and mix until blended. Pour mixture back into the same saucepan and cook on low heat so that eggs don’t become scrambled. Stir mixture in a figure 8 pattern with a wooden spoon so that all sides of the pot are touched as you cook it. Continue cooking until you can draw your finger across the back of the spoon and it makes a mark through the ice cream base without it running back on itself. Remove from heat and pass it through a sieve and into a bowl that’s sitting over the ice water. Stir ice cream base until cools down. Cover ice cream base bowl with plastic and chill thoroughly for at least 8 hours. To make your peanut butter shortbread cookies, start by combining butter, peanut butter, sugar, salt, and vanilla extract in a small bowl and mix with the KitchenAid® 5-Speed Ultra Power™ Hand Mixer until mixture is smooth and fluffy. 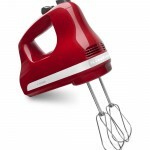 Change speed on Hand Mixer to low (speed 1) and add flour. 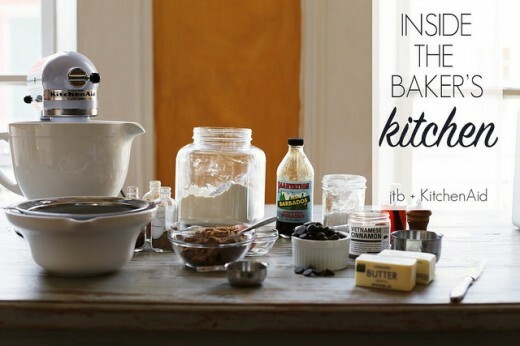 Continue mixing until ingredients are combined and flour is well incorporated. At this point your dough may look crumbly. Try patching it together with your hands to form a ball of dough. Divide dough in half and flatten each half into a disc. Roll discs of dough in between two pieces of wax paper until dough is 1/8” thick. Cut out rounds of dough using a 3” fluted cookie cutter. 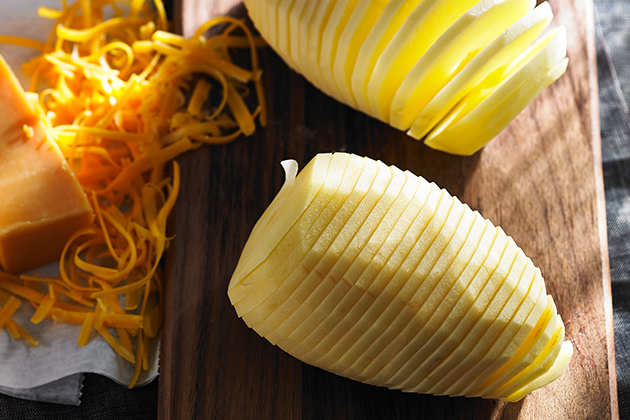 Place the cutout pieces on KitchenAid® Professional-Grade Nonstick Jelly Roll Pans. You can use a small offset spatula or a butter knife to transfer the cookies onto the baking sheets so that they don’t break apart. Refrigerate, bake, and sprinkle with sugar as soon as cookies come out of the oven. Store cookies in an airtight container and freeze until further use. Pour chilled ice cream base into a container with a spout and pour base slowly into chilled KitchenAid® Ice Cream Maker Attachment bowl. Spin ice cream on speed 2 until desired consistency is achieved. Turn mixer speed to STIR (speed 1) and fold grape jelly into ice cream. Put ice cream into a chilled container and freeze immediately. To assemble the peanut butter and ice cream sandwiches, spread grape jelly on the inner side of all peanut butter cookies. Place cookies in pairs onto working surface and scoop ice cream on the side that will act as the base of the ice cream cookie sandwich. Place the lids over the ice cream and press down gently on them so that the ice cream comes out of the edges slightly. Freeze until ice cream becomes chilled and firm once again. Place roasted finely chopped peanuts in a bowl and roll the sides of the ice cream sandwiches on the peanuts so that the peanuts adhere to the ice cream. Freeze until ready to serve. 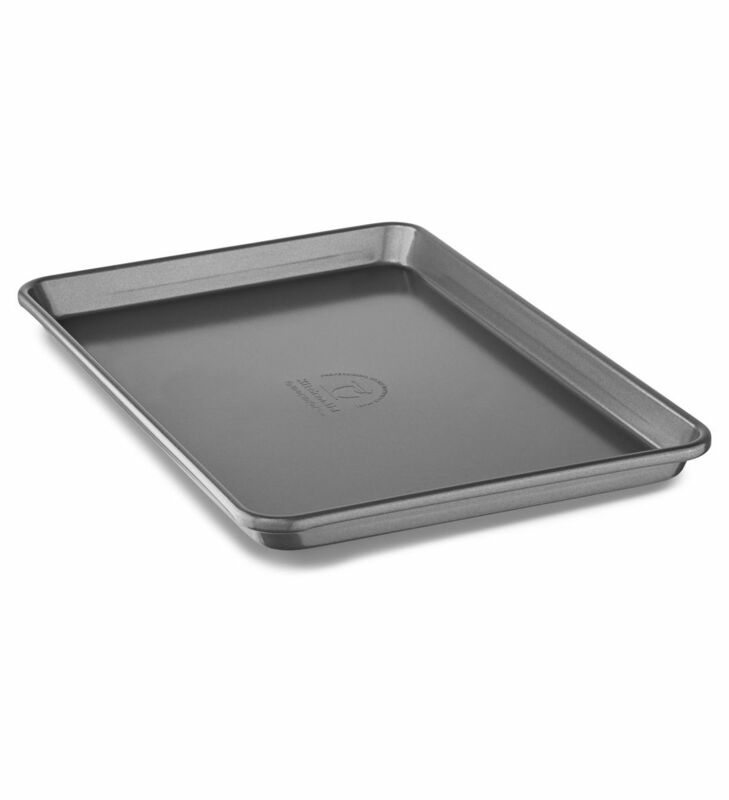 Preheat oven to 350 F. Cover three 15” x 10” KitchenAid® Professional-Grade Nonstick Jelly Roll Pans with parchment paper and set them aside for later use. Combine butter, peanut butter, 2 cups of sugar, salt, and vanilla extract in a bowl and mix with KitchenAid® 5-Speed Ultra Power™ Hand Mixer on medium-high (speed 3) until butter is smooth, light, and fluffy, for about 3 minutes. Turn mixer off and scrape sides of bowl. 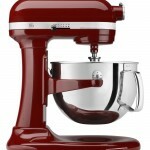 Change speed on Hand Mixer to low (speed 1) and add flour. Continue mixing until ingredients are combined and flour is well incorporated into dough. At this point your dough may look a bit crumbly. Knead it so that it becomes smoother and less crumbly. Divide dough in half and flatten each half into a disc. Cut the first disc of dough in half and work it with hands until it’s pliable. Place dough in-between two pieces of wax paper that are approximately 8” x 11” in size. Use a rolling pin to roll cookie dough in-between pieces of wax paper until dough is 1/8” thick, turning dough 90 degrees after each time. Peel off the top wax paper. Cut out rounds of dough using a 3” fluted cookie cutter. With the help of a small offset spatula or a butter knife, place the cutout pieces on prepared KitchenAid® Jelly Roll Pans. Refrigerate cookies for about 10 minutes or until cookies become firm. Repeat step 4 with second flattened piece of dough. Combine scraps of dough into a ball, flatten dough, and roll it in-between two pieces of wax paper. Cut out cookies with fluted cookie cutter and place cookies on prepared Jelly Roll Pans. Remove two Jelly Roll Pans from refrigerator and bake cookies for approximately 10-12 minutes, until edges are golden brown. Place baking sheets on a cooling rack and sprinkle with leftover sugar as soon as they come out of the oven, being sure to save some sugar for the last tray of cookies. Allow cookies to cool down completely. Repeat same baking procedure with the third baking sheet. Store cookies in an airtight container and freeze until you are ready to assemble ice cream sandwiches. (Note: Container that will be used to store spun ice cream must be chilled for at least 30 minutes before placing the ice cream inside of it). Meanwhile, combine egg yolks, sugar, and salt in KitchenAid® Stand Mixer bowl. Attach whisk to mixer. Turn mixer to speed 2 and mix for about 45 seconds until mixture thickens and becomes pale yellow in color. Continuing on speed 2, very gradually pour simmered heavy cream-milk mixture into Stand Mixer bowl and mix until blended. Pour mixture back into the same saucepan and cook on low heat so that eggs don’t become scrambled. Stir mixture in a figure 8 pattern with a wooden spoon so that all sides of the pot are touched as you cook it. Continue cooking until you can draw your finger across the back of the spoon and it makes a mark through the ice cream base without it running back on itself. Remove from heat and pass it through a sieve and into a bowl that’s sitting over the ice water. Stir ice cream base until it cools down. Cover ice cream base bowl with plastic and chill thoroughly for at least 8 hours. 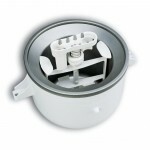 Assemble and engage KitchenAid® Ice Cream Maker Attachment bowl, dasher, and drive assembly as directed by attachment instructions. Turn speed on Stand Mixer to STIR (speed 1). Pour chilled ice cream base into a container with a spout and pour base slowly into freeze bowl. Spin ice cream base for 15-20 minutes or until desired consistency is achieved. Pour 2 1/2 cups of grape jelly into ice cream bowl, a little bit at a time, until all of the jelly is added. Continue to mix on speed 1 until grape jelly is nicely folded into the ice cream. Transfer ice cream to a chilled airtight container and freeze for about 6 hours. 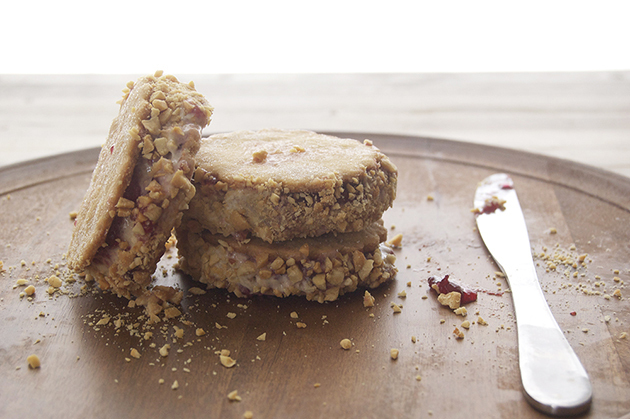 To assemble ice cream sandwiches, turn peanut butter cookies over and spread about one teaspoon of grape jelly on the inner side of each cookie. Pair the cookies into pairs on a large platter or tray and scoop ice cream on the side that will act as the base of the ice cream cookie sandwich. Work as fast as you can, continuing to scoop ice cream on the base of every ice cream cookie sandwich. Place the lids over the ice cream and press down on the top cookie so that the ice cream comes out of the edges slightly. 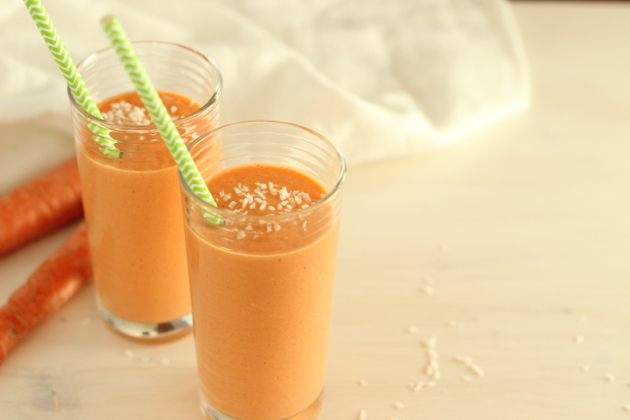 Freeze for about 30 minutes. Place roasted finely chopped peanuts in a bowl and roll the sides of the ice cream sandwiches on the peanuts so that the peanuts adhere to the ice cream. Freeze ice cream sandwiches until they are ready to be served.